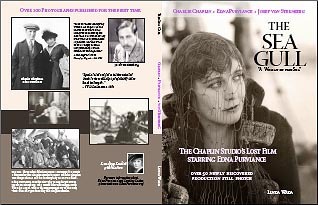 On the eve of the Bioscope Festival of Lost Films, congratulations go out to Linda Wada of the esteemed Edna’s Place blog and www.ednapurviance.org website, for today publishing her long-awaited book The Sea Gull, on this mysterious lost Chaplin film. The film, originally known as Sea Gulls or The Sea Gull, and later as The Woman of the Sea was produced by Chaplin but written and directed by Joseph von Sternberg, in 1926. The film was a melodrama set among the fishermen on the coast of California, and starred Edna Purviance, Chaplin’s great leading lady. According to von Sternberg, the film had just one screening, before Chaplin withdrew it for reasons that remain unclear, though he did say at one point that it simply wasn’t good enough for release. The Sea Gull is an important contribution to film history, and worth buying for the stills alone. The look of the film, revealed in these marvellous photographs, makes it all the more tragic that it was destroyed. This book provides the nearest experience we will have to seeing it. Details of how to order the book can be found at http://ednapurviance.com. It is being published as print-on-demand by Leading Ladies, price $39.95 plus shipping, and can be bought using PayPal. I recall from David Robinson’s book that the film was put aside (or shelved), and later destroyed when he was being harassed by federal authorities of some type for taxes or something. They had written it off as a loss (or desired to) and in order to prove that it was worth no money, they had to burn the print! What a horrible, solemn occasion that must have been. In any case, it is fantastic to hear about this book chock full of photographs. Definitely a big shame to have lost a film in such a ridiculous way. P.S. – I’m a big silent film fan, and I plan to be checking in on your blog frequently, as it looks really excellent! You’re right, thought the original negative wasn’t burned until 1933, various witnesses to the burning signing affadavits to confirm that they had seen it go up in flames. Thanks for the kind words about The Bioscope. It’s time-consuming, but addictive to produce.